Las mujeres sexualmente atractivas y monstruos feos. 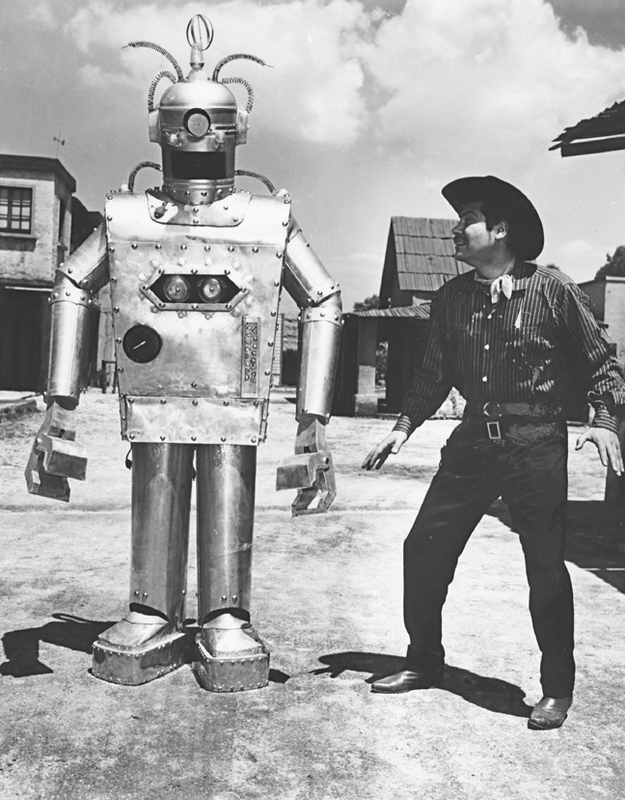 In the mood for a Mexican sci-fi/horror/western/musical/romantic comedy? There’s only one in the world. I’m guessing. 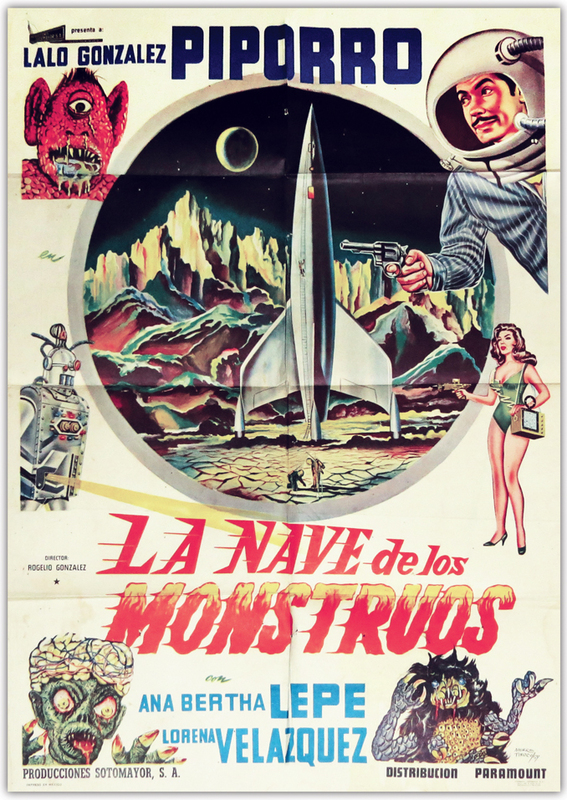 “La nave de los monstrous” (1960), aka “The Ship of Monsters,” is a genre-bending treasure from south of the border. “Nave” has curvy women, gnarly monsters, an engaging male lead and a winking sensibility you can almost call hip. Plot: The men of Venus have all perished in that planet’s “atomic scourge.” So Venusian beauties Gamma (Ana Bertha Lepe, Miss Mexico 1953) and Beta (Lorena Velazquez, Miss Mexico 1960) are dispatched to kidnap males from around the galaxy, in order to repopulate Venus. Not much thought is given to the perils of intimate interplanetary relations. Gamma and Beta planned to bring these four male specimens to Venus to repopulate the planet. Blech! The girls kidnap four alien males – those abductions happen off-screen – which they keep frozen in big blocks of ice. Torr informs the ladies that the rocket ship is having engine trouble, which necessitates an emergency landing … on planet Earth. There, a cowboy named Laureano (Lalo Gonzalez, aka “Piporro”) witnesses a streak of light from the ship, which he assumes to be a falling star. In song, he wishes upon the star … for a woman. His wish comes true in duplicate; two knockouts in wild duds sashay in his direction. (Laureano assumes they are circus performers.) He falls for Gamma, even after receiving a hungry kiss from Beta. Laureano (Lalo Gonzalez) with Torr. Laureano has chosen wisely. We later find out that Beta is a Uranite – that is, a Venusian vampire. She breaks from Gamma, sets loose the four aliens, and plots to become queen of Earth. The four monsters slither along the fine line between creepy and goofy. These creature designs have more, and better, articulation than in any other Mexi-movie I’ve seen. One is sort of a brain monster; one is a furry insect; one is a scaly cyclops; and one is, simply put, a dinosaur skeleton. They all speak Mexican Spanish, of course. When the boney one speaks in a low, purring voice, you think you’ve suddenly stumbled into a funhouse-mirror iteration of Guillermo del Toro’s “Pans Labyrinth. You’ll recognize some players from other Mexploitation films. Velazquez starred in “Doctor of Doom” (1963) as shapely female wrestler Gloria Venus. (Could Velazquez play any character that wasn’t shapely?) Gonzalez was a beloved Western-comedy star in Mexico, and a recording artist with an extensive discography. Plus-sized Manuel Alvarado plays Ruberto, a local who grows tired of the tall tales Laureano spins in the town watering hole. Alvarado later appeared onscreen with horror master Boris Karloff in “House of Evil” (filmed in 1968), Karloff’s second-to-last film.